Russia 24 news channel aired the story about the weather in Syria. According to the leading weather forecast service, Russia has chosen a successful – in terms of weather conditions – time to start bombing. The forecaster noted that in October, the wind speed is low, the rains come only once in every ten days, and the temperature rarely rises above +35 °, which is critical for the air strikes. In early 2015, Russia 24 aired the weather forecast for Dobaltsevo, Ukraine, where battle between Ukrainian army and the separatists were going on. 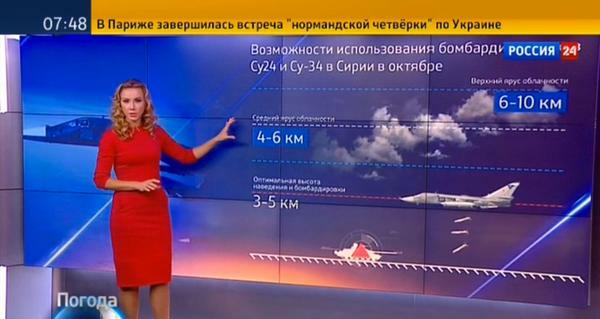 Apparently, there is a new trend on Russian media to report weather forecast of war zones, where Russia is involved. Why brainwashes? Did they lie about the weather in those territories? It’s just a weird tendency taking place on this channel.